Heads up, travelers: Hundreds of workers are striking at Chicago O'Hare International Airport on Tuesday. Janitors, baggage handlers, cabin cleaners and wheelchair attendants are asking for a $15 hourly wage. Some currently make $10.50 an hour, which is the minimum wage in Chicago. The effort is part of a broader "Day of Disruption" planned by activist group Fight for $15, which advocates for raising the minimum wage. Uber drivers, fast food workers and home care aides will also walk out on Tuesday. The Chicago Department of Aviation said that despite the work stoppage operations at the nation's second busiest airport continued to run smoothly. Federal employees, including air traffic controllers and security screeners, are not joining the strike. The striking workers aren't aiming to disrupt travel, a spokeswoman for the Service Employees International Union said at a press conference last week. "They do want to gain public support," she said. The airport workers aren't part of the Service Employees International Union, but the group is backing them. Though the walkout isn't likely to strand passengers, it could cause some operational hiccups. "Some planes may not get fully cleaned, and bag handling may have some snafus," said Joseph Schwieterman, a transportation expert and professor at DePaul University in Chicago. 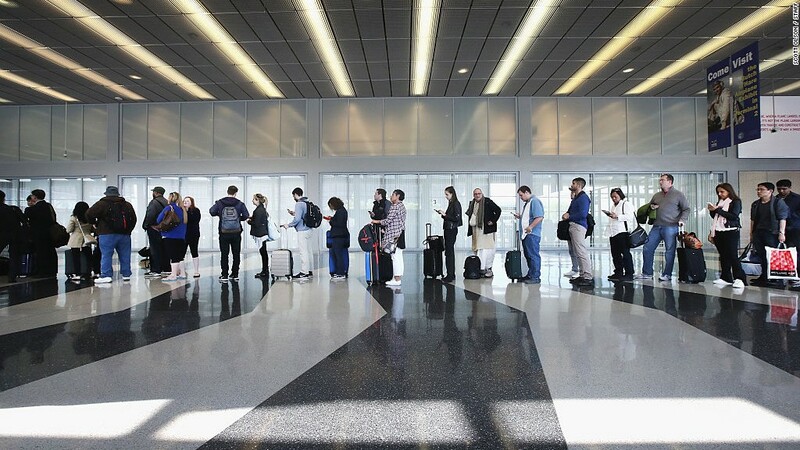 Those participating in the strike are contracted by Prospect Airport Services, AirScrub Inc. and the city of Chicago. They haven't decided how long the strike will last yet, SEIU spokesman Marc Goumbri said. Kisha Rivera, who works as a cabin cleaner at O'Hare, said she has coworkers who sleep in the airport because they can't afford apartments. "We work so hard and we hardly even get breaks," she said. "When we go from plane to plane, we can't even go to the bathroom." O'Hare is a hub for both American Airlines (AAL) and United Airlines (UAL). Both airlines said they prepped for the strike to avoid inconveniencing fliers. "We are working closely with our vendors to ensure there is no disruption to our operation," American said in a statement. United said it is "taking the necessary steps to ensure a safe and on-time operation for our customers." The striking workers will be joined by others protesting low wages at a 12 p.m. rally outside the airport. Concurrent rallies will take place at nearly 20 airports around the country, including Los Angeles International Airport and Newark-Liberty International Airport, Goumbri said. -- CNN's Bill Kirkos contributed to this report.